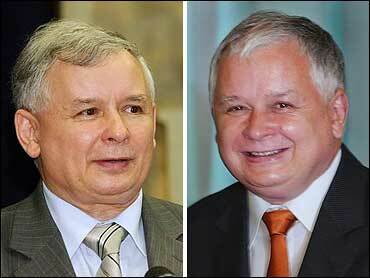 President Lech Kaczynski appointed his identical twin brother, Jaroslaw, as the new prime minister, the presidential Web site said. Prime Minister Kazimierz Marcinkiewicz and his government formally resigned earlier in the day, paving the way for Jaroslaw Kaczynski to form a new government. His resignation came in a meeting with the president two days after the governing Law and Justice party decided to replace him with party chairman Jaroslaw Kaczynski. "I thanked him for his very good governing," Lech Kaczynski said in a brief statement after a 45-minute meeting with Marcinkiewicz at the presidential palace. The Web site announcement said the president "appointed Jaroslaw Kaczynski as the president of the Council of Ministers," using the formal term for prime minister. Marcinkiewicz departed amid reports of disagreements between him and Jaroslaw Kaczynski, who was widely regarded as the power behind the scenes of the outgoing government. The rift was reportedly growing recently over conflicting views of Poland's economic policy. Most of the current ministers are expected to stay in the new government under Jaroslaw Kaczynski, who has said his future Cabinet would continue Marcinkiewicz's pro-social welfare policies. Law and Justice sealed a coalition deal in May with two Euro-skeptic parties — the farm-based Self-Defense and the Roman Catholic League of Polish Families. In one expected change on Sunday, Jaroslaw Kaczynski picked Stanislaw Kluza, a pro-market economist who served over the past two months as a deputy finance minister and head of the ministry's research department, to head the Finance Ministry in his future Cabinet. Jaroslaw Kaczynski said at a news conference that Kluza would continue the policies of his predecessor, Zyta Gilowska, who — until she resigned two weeks ago — was seen as the key guarantor of fiscal responsibility in Poland's government. Marcinkiewicz will now run as the Law and Justice party's candidate for mayor of Warsaw in fall elections. Though the Kaczynski brothers have the same round faces and short, stout builds, many Poles have learned to distinguish them, thanks to the fact that Lech has two moles on his face, and wears a wedding ring. Jaroslaw is unmarried, and has no moles. The 57-year-old twins — who happen to be Geminis — first won fame as child actors in the 1962 hit film "The Two Who Stole The Moon." Though their show-business careers stopped there, they became politically active when they joined the anti-communist opposition in the 1970s. They later served as advisers to the Solidarity movement in the 1980s. After the fall of communism, they served briefly as advisers to Solidarity leader Lech Walesa during his 1990-95 presidency, but later fell out with him.